commented on "A picture describes your dent quickly to get a quote. 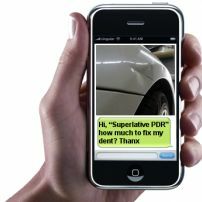 Send pictures to 0419190752"
This is the easy way to let us estimate the repair cost. commented on "Before & After Pictures of dents removed by SUPERLATIVE Automotive Enhancements & Repair"
commented on "Jeep, Right Front Guard"
commented on "VE Ute Door Dent"